Shaw’s Crab House (Chicago and Schaumberg locations) kicks off summer Monday, May 25 with 1/2-price oysters in the Oyster Bar all day. All weekend (May 23rd to May 25th) Shaw’s Chicago has its New England Lobster Boil special (one-pound whole Maine lobster plus Red Bliss potatoes, cole slaw, and corn on the cob) for $38 (plus tax and gratuity). $16 more gets you an additional 1-lb. lobster. Castaways, the bar on North Avenue beach, opens this Memorial Day weekend with live entertainment Saturday through Monday. Come for lunch or dinner or drinks (11 am to 9 pm if it’s not raining). Pick from fresh salads, wraps, sandwiches, and quesadillas and drink a toast to summer with frozen cocktails or even Corona in a can (no bottles on the beach). Commonwealth Tavern, 2000 W. Roscoe, has brunch 10 to 2 Saturday and Sunday, with a $6 Bloody Mary bar and a $3 Mimosa bar. Check out the new menu items: Pupusa (breakfast sausage, chihuahua cheese, red sauce, curtido, farm egg), Pig Muffin (maple pig head, farm egg, American cheese, English muffin), and Kentucky Hot Brown (smoked turkey, bacon, tomato, beer cheese, sourdough). Frontier Tavern, 1072 N. Milwaukee, has an all-you-can-eat crawfish boil complete with potatoes and corn-on-the-cob. Come at 3 pm and pay $25 (plus tax and gratuity). These guys know how to cook proteins. Lotties Pub, 1925 W. Cortland, roasts a whole pig for Memorial Day. Sunday, May 25 beginning at 2 p.m for $12 all-you-can-eat cured and smoked pig roast, complete with baked beans, potato salad and coleslaw. Drink specials, too. Stretch Bar and Grill, 3485 N. Clark St., Sunday and Monday offers $5 GI Jameson shots and 25% off their bill to all veterans with proof of Military ID. Good for you, guys. And thank you to our servicemen and women. 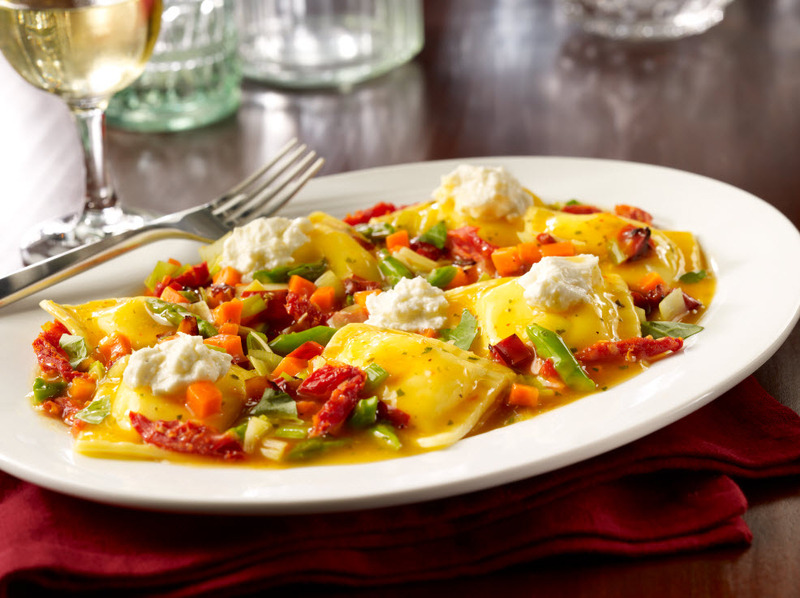 Maggiano’s shares GF ravioli dish recipe! 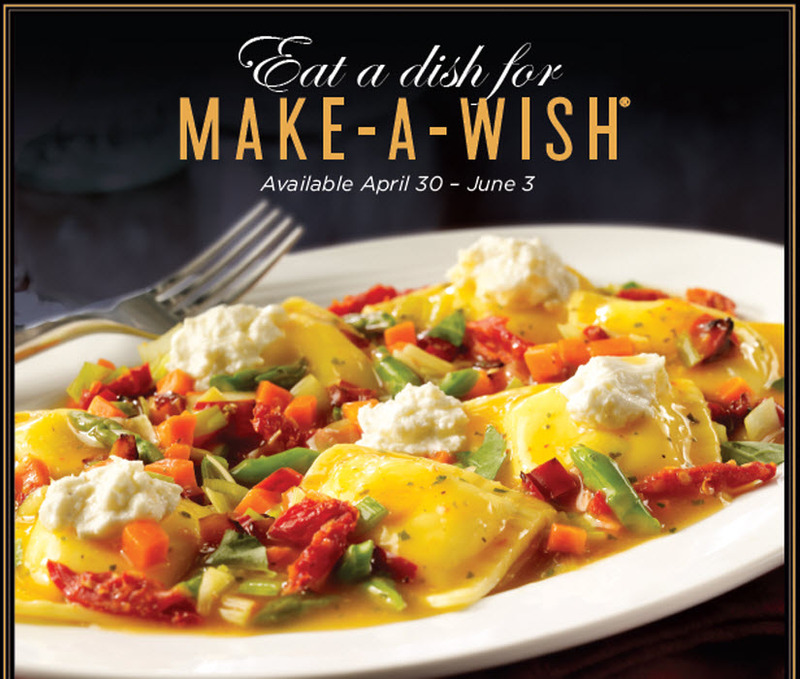 I recently tasted a wonderful gluten-free ravioli dish that Maggiano’s is serving as part of its Make-a-Wish promotion going on through July 8 at all locations (read more here). I was curious as to how they got that pasta so toothsomely good. Jeff Mann,* Research & Development chef for Maggiano’s nationwide, was gracious enough to share the recipe for the dish and talk about how he developed it. He also talked about how they developed the GF pasta, but he didn’t share that recipe. No matter. I guarantee, if you put together a pasta dish with this sauce, vegetable accompaniment and topping, it’s going to knock your socks off no matter what kind of pasta you use. The Mascarpone/truffle oil cheese topping alone is delightfully flavorful. Preheat your oven to 375˚. Once you have diced your yellow and red peppers place in a small bowl, toss with olive oil and season with salt and pepper. Place on a baking tray and cook for approximately 10-12 minutes or until there is slight char to the peppers. Remove from oven and reserve until the rest of the vegetables are ready. Place a pot of cold water on stove on high heat. Season water with salt to add flavor to your carrots and asparagus. Once the water has come to a boil, place asparagus in boiling water and cook for 2-3 minutes depending on how thick the asparagus is. Once the asparagus is al dente place in an ice bath to stop the cooking process. While asparagus is cooling in ice bath place diced carrots in same boiling water and cook for 1 minute. Place carrots in water bath to stop the cooking process. Once asparagus and carrots are cool place in a bowl and reserve. Cut one small leek in half lengthwise. Then split the leek in half lengthwise again. Cut into ½” pieces. You want to use some of the green part for flavor. Rinse leeks very good to remove all dirt. Place clean leeks in same bowl as carrots and asparagus, then add roasted peppers that have cooled reserve. Place gluten free chicken stock in a medium sauce pot add fresh thyme, bay leaf and black peppercorns and place on stove on a medium high heat and bring to a simmer. While stock is heating place 2 Tablespoons of cold water in a small bowl with the cornstarch and mix together so corn starch dissolves. Once stock has come to a simmer add corn starch water mixture to stock and continue to cook for 2-3 minutes or until slightly thickened. Turn off burner and slowly add small diced Parmesan cheese and mix until all cheese has melted into the chicken stock. Strain the broth making sure to remove bay leaf, thyme and whole peppercorns, reserve broth. Place softened cream cheese and Mascarpone in a mixing bowl and mix until incorporated. Add white truffle oil, salt, and pepper. Continue to mix until everything is incorporated, reserve. Place Parmesan broth in a large sauté pan and place on medium high heat. Add butter; once butter has slightly melted add your gluten-free raviolis. (Make sure they are not frozen and have thawed in your refrigerator. If you can’t find gluten-free ravioli you may use any gluten-free pasta of your choice. (Follow cooking instructions for gluten-free pasta on box for cooking). Once broth has come back to a simmer, add your spring vegetables and sun-dried tomatoes and continue to simmer, making sure that the raviolis are not sticking to the bottom. There should be enough of the broth to be able to simmer the ravioli or pasta to cook all the way through. Once heated all the way through, turn off heat. Add fresh chopped basil and mix to incorporate. Place ravioli or pasta on a large platter or you may divide into 4 different plates. Evenly distribute the vegetables on top of the pasta. Place 3 to 4 small dollops of the truffle Mascarpone on top of each dish and enjoy. You walk in to the dark-wood-paneled room and hear the strains of a Frank Sinatra song and notice the fresh gladiolas. You inhale the Italian cooking smells and get a warm greeting from the host/ess. People are helping themselves from family-style platters and bowls. It’s gotta be Maggiano’s. Some of the best gluten-free pasta I’ve ever tasted. Chicago’s downtown Maggiano’s, 516 N. Clark at Grand, was the first to open nearly 25 years ago – there are 49 locations now. And right now all of them are participating in a double-barreled promotion called “Eat a Dish for Make-a-Wish.” They’re featuring a unique, gluten-free pasta dish on two slightly different MaW menus. When you order any dish on these menus, Maggiano’s makes a donation to Make-a-Wish. Nationwide so far, they’ve donated a total of $5 million. Read more on their Make-a-Wish blog. PATRICIA’S CHEESE RAVIOLI – uniquely delicious gluten-free pasta with a lovely texture – hard to achieve with gluten-free. Loved the Truffle Mascarpone cheese topping. The dish is named for Patricia because Maggiano’s is sponsoring her wish to travel to Rome, Italy. ***This item comes with the “Take a dish for tomorrow” deal (see below). CRÈME BRÛLÉE TRIO – absolutely lovely, chocolate, traditional and honey. Num to all three. Drinks include “Wish Lemonade” (peach and pomegranate infused) and a potent and tasty white Moscato-based Sangria flavored with pineapple, strawberry and cantaloupe and spiked with vodka. These are both excellent; the fruit flavoring is just enough to make it refreshing without being too sweet. Watch out for the Sangria; it does have a kick! Available June 4 through July 8 is a similar menu except the shrimp will be served with sweet corn relish and honey glaze, and gluten-free Flourless Chocolate Cake replaces the crème brulée trio. By the way, all Maggiano’s chefs are more than happy to discuss special diet needs with any guest, and they go out of their way to accommodate whatever you need. ***Maggiano’s offers a really good deal that I didn’t know about. Any guest who orders a pasta dinner gets the option to take home another order of pasta to eat at home the next day! Talk about value for your dollars. This is a painless way to donate to a worthy cause and enjoy some good food – two days in a row! Also, be aware that Maggiano’s has lots of dark-wood-paneled rooms for private parties, business meetings and banquets. I’ve been there for a number of those events and they always do a great job. BEST BARS IN AMERICA has an upcoming episode featuring Chicago on Wednesday, May 20 at 9/8C! In the episode, Sean and Jay (comedian hosts) meet Esquire drinks editor Dave Wondrich in Al Capone’s old spot Green Mill Cocktail Lounge and get a taste of the local music with Blues legend Buddy Guy at Buddy Guy’s (of course). They also get a lesson in gin at Scofflaw, head to visit their favorite Maria’s, stop in for a quick hangover IV, get the ‘Picasso’ treatment at neighborhood landmark and legendary comedian hangout the Old Town Ale House, and sip culinary cocktails with fellow comedian Pete Holmes at The Drawing Room. Look for the Chicago episode on Wednesday, May 20 at 9/8C on Esquire Network (find it on your Dish or DirectTV or cable network). You probably know that the argument about screwtop wine closures has been resolved. They work. They preserve the wine exactly where it is when the winemaker puts it in the bottle, according to Don J. Huffman, a farmer-turned-winemaker who’s now traveling the country to educate consumers about wine closures. Part of the reason they do, he says, is that they are completely impermeable—no oxygen gets into that wine after it’s bottled, unlike how it does, very gradually, enter the bottle when a wine is sealed with a cork. That cork leakage is what’s behind the idea of “cellaring” your fine wines. The winemaker knows the rate at which oxygen will be entering that bottle, and so s/he calculates how many years in the cellar will continue to make it eminently drinkable. Complicated, eh? Yep, those winemakers are pretty much geniuses when it comes to this stuff. But Huffman admits, lots of consumers don’t want a wine closed with a screwcap. He says he personally always uses an aerator to decant a wine closed with a screwcap. And his concern about these things is why he works with a company called Nomacorc. They market a new type of wine closure—a permeable cork that has several distinct advantages over regular cork, including giving the winemaker the ability to call the shots on when a cellared bottle is at its absolute prime. Eliminates faults and returns. You’ll never have to take back a bottle with a Nomacorc or deal with a broken or crumbling cork. Your wines will taste the same, from bottle to bottle, because Nomacorc uses the latest technology to control oxygen ingress. Nomacorcs are recyclable and have a very low carbon footprint, especially compared to screwcaps. You get to experience the traditions connected with opening fine wines–smelling and looking at the cork and hearing that lovely “pop” when you open the bottle. Read more in a separate post about the environmental impact of Nomacorc compared to other types of closures.